Let our experience with Alzheimer's and Dementia save you the time and frustration of going it alone. Have you found yourself worrying about an elderly parent’s declining memory? Do you believe that their increased confusion or disorientation might be interfering with their ability to care for themselves and may even pose a safety issue? If so, know that you are not alone. Currently, 5.2 million people in the U.S. have been diagnosed with Alzheimer’s or a related dementia. With Eldercare Services there to back you up and demystify these common challenges of caring for aging parents becomes easier. Your family can gracefully face Alzheimer’s and dementia. You can be confident in the knowledge that you have a team of experts looking out for you and offering the best solutions. Linda Fodrini-Johnson, the founder of Eldercare Services, was the director of the very first Alzheimer’s Respite Program in the San Francisco East Bay area, serving her community from 1984-1990. Building on her years of experience working with seniors, Linda has become a passionate advocate for families and individuals affected by dementia who are committed to continuing to live their lives to the fullest. Learn more about Linda or check out her professional credentials here. Eldercare’s Aging Life Care ManagersTM are certified experts who partner with families caring for aging parents to ensure correct diagnosis. We then generate individualized care plan solutions and provide support systems that allow patients with dementia to live in their homes and communities for a long time. Coaching: Our care managers all hold advanced degrees and act as coaches to assist with problem solving and create solutions to manage the changes that develop as illness progresses. We always focus on “quality of life” for everyone, which means reducing stress for family members and protecting the self-esteem and sense of self-worth of those with the illness. Aging Life Care ManagersTM also refer families to community resources, outreach programs, grants and entitlements. Get to know our Care Management Team! Counseling: Individuals in the early stage of Alzheimer’s and dementia—as well as partners and entire families—are often overwhelmed by the changes and challenges that this illness can produce. That’s why we have a team of 6 licensed therapists and psychologists to assist with and ease the pain of the mental and emotional side effects of Alzheimer’s and related dementias. Learn more about our Mental Health services. Home Care: All of our caregivers are trained in Alzheimer’s care and are experienced in working with all types of dementias. Our home care team specifically matches our caregivers based on their expertise and your unique situation. We provide additional coaching to ensure we provide the most successful care with minimal stress and disruption. 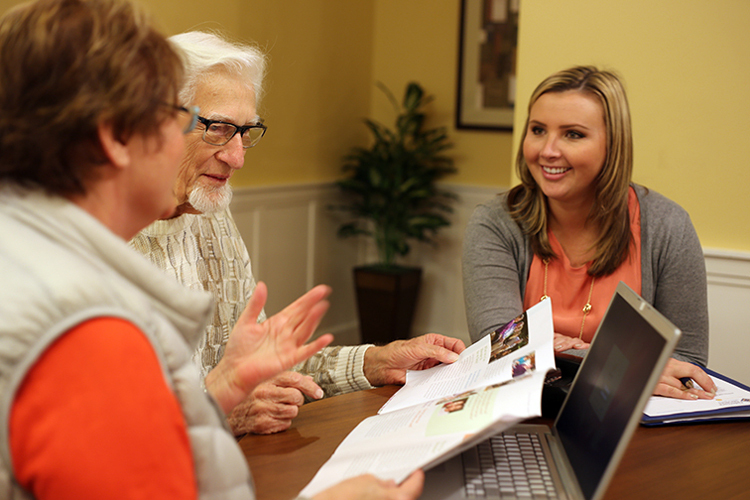 Find out more about how we work with families to customize home care strategies. We believe that joy can be infused into every life—no matter what the deficit or issue being faced. For this reason, part of every one of our care plans includes pro-active activities to create happiness and bring peace into all our clients’ lives. Additionally, we offer a free monthly family caregiver support group so that you can become part of a community that fosters support and respect. Furthermore, we offer free quarterly classes on a variety of topics related to family caregiving. Empowerment begins with education. So, we want to equip you with new tools and teach you how to use them. Check out our Educational resources. Sign up for our monthly newsletter so you never miss one of our classes! Caring for aging parents is a challenge. But, it’s not impossible with the right help. Let Eldercare improve the quality of life for you and your loved ones.